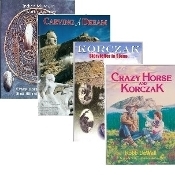 Included in this special money saving 4-book set is Carving a Dream, Indian Museum of North America®, Korczak: Storyteller in Stone, and Crazy Horse and Korczak. A $34.80 value for $26.00! By Robb DeWall. A photo history of Crazy Horse Memorial® and the Ziolkowski family, year-to-year chronology of the progress and dramatic photos taken by Korczak of his sculpture. Thirteenth revised edition, August, 2008, partially updated through 2011. 60 pages, 9" x 12". With each turn of a page, this book will take you on a tour of the Indian Museum of North America here at Crazy Horse Memorial®. This full color book captures the sight of the colorful lives of the Native Americans, both past and present. Great for the classroom as well as a library. New edition 2008. 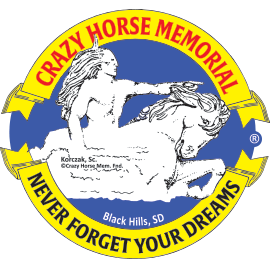 Published by Korczak's Heritage, Inc. for ©Crazy Horse Memorial Foundation. 37 pages. A capsule biography of sculptor Korczak Ziolkowski from his early years in Boston and Connecticut to the living legacy of the Crazy Horse Memorial. It tells how he met Henry Standing Bear and why he believed in the dream of Chief Standing Bear. An appendix of his final days follows. 80 pages. By Robb DeWall with line drawings by Marinka Ziolkowski. The story of the mountain carving told by the sculptor. Written primarily for young people, the book is popular with all ages. Second revision 2012. 154 Pages.